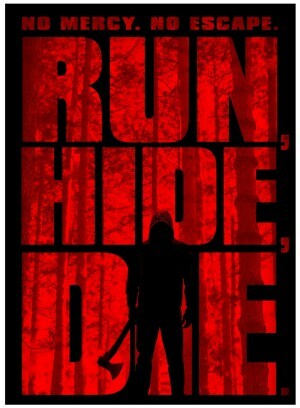 RUN, HIDE, DIE (DVD Artwork). ©Image Entertainment. As temperatures dip, a variety of new horror and mystery titles are on tap for home entertainment offerings this week. 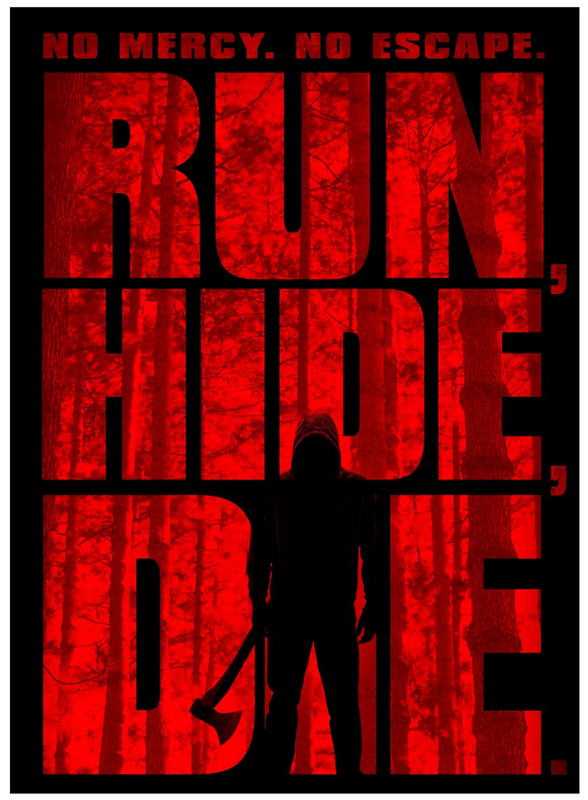 “Run, Hide, Die” is available on DVD, VOD and Digital HD Tuesday, Sept. 1. Directed by Collin Joseph Neal (Altered), the horror drama stars Alison Monda (“Shadowed”), Tabitha Bastien (“The Anatomy of Monsters”), Keiko Green (“C.O.G.”) and Gail Harvey (“The Off Hours”). A year after the husband of Addison Davenport (Monda) was found murdered in their home, the emotional wounds are still raw and gaping. On this devastating anniversary, Addison’s in-laws generously offer her their summer cabin as a healing retreat. With her four best friends in tow, Addie sets off for this idyllic spot, deep in the woods, to find some peace and possibly even some fun. But it soon becomes clear that the girls are not alone, as each is savagely captured and terrorized. One of them is hiding a dark secret, for which their tormentor plans to exact a brutal revenge. Before the night is over, what began as a carefree road trip will descend into a shocking bloodbath of malice and butchery. “Dark Was The Night” is available on DVD Tuesday, with a special Blu-ray edition available exclusively the same day at Best Buy. Durand plays Sheriff Paul Shields, sworn to protect Maiden Woods, a remote and quiet town of decent hard-working people. But something stirs in the dark woods surrounding this isolated community. After a logging company decimates an area of the forest, a rash of increasingly violent and unexplainable events transpires. The sheriff and his deputy (Haas) struggle to confront their own personal demons while facing down a new breed of raw terror that is possibly older than humanity itself, and much hungrier. Bonus material includes a behind-the-scenes featurette called “A Trip to Maiden Woods,” as well as a Q&A with the cast. The end of humanity is the beginning of non-stop action and excitement in “Extinction,” available on DVD and Digital HD Tuesday from Sony Pictures Home Entertainment. Matthew Fox (TV’s “Lost,” “World War Z”) and Jeffrey Donovan (TV’s “Burn Notice,” “Hitch”) team up on screen as survivors of a zombie apocalypse and former friends, who must put aside their differences to stop an attack by terrifying creatures with an insatiable appetite for human flesh. Directed by Spanish filmmaker Miguel Angel Vivas, who came to global attention for 2010’s home invasion horror/thriller “Kidnapped,” “Extinction” marks Vivas’ English-language debut with loads of action and zombies. For nine years, Patrick (Fox), Jack (Donovan) and his daughter Lu (Quinn McColgan) have outlasted the zombie apocalypse by shutting themselves off in the snowbound town of Harmony. The monsters have seemingly disappeared, with no sign of other survivors, but the constant fear of the unknown is starting to take a toll on this makeshift family. When Patrick goes scavenging for food, he discovers the undead have returned and evolved into something terrifying, beyond imagination. Vivas co-wrote the screenplay with Alberto Marini (“Sleep Tight”), based on the novel “Y pese a todo…” by Juan de Dios Garduno. Co-starring award-winning Spanish actress Clara Lago (“Spanish Affair”), this horror thriller arrives on DVD packed with lots of bonus features, including eight in-depth behind-the-scenes featurettes. “Extinction” has a run time of approximately 110 minutes and is rated R for horror violence, terror and language. “The Curse of Downers Grove,” a thriller currently in theaters and available on Digital HD, will be available Tuesday on DVD, Blu-ray and On Demand. Inspired by true events, the town of Downers Grove looks like your average suburban neighborhood but it also has a disturbing secret. For the past eight years, one senior from every high school graduating class has met a bizarre death right before graduation day. This year, Chrissie Swanson (Bella Heathcote, “Dark Shadows,” “Pride and Prejudice and Zombies”) has a terrible feeling that she is going to be the one to die. THE CURSE OF DOWNERS GROVE. (Blu-ray / DVD Artwork). ©Anchor Bay. Horror on the open water is in store in “The Surface,” starring Sean Astin (“The Lord of the Rings” franchise), Chris Mulkey (“Whiplash”), and Mimi Rogers (“Austin Powers: International Man of Mystery”), a suspense thriller. When a plane crashes into unpredictable Lake Michigan, the pilot (Mulkey) is pulled from the wreckage by Mitch (Astin), who has been stranded on his boat. Immediately suspicious of each other, these two strangers must overcome their differences to find a way back to shore. Together, they must fight against the harsh elements if they have any hope of making it back alive. Gil Gates, Jr. directs the action drama from a script by Jeff Gendelman. Special features include an audio commentary, a featurette on the score with composer Jeff Russo, deleted scenes, a documentary called “Inland Seas: Understanding and Protecting the Waters of the Great Lakes” and more. “Dark Was The Night” is available on DVD Tuesday. A special Blu-ray edition is available exclusively on that date at Best Buy. Maiden Woods is a remote and quiet town of decent hard-working people, but something stirs in the dark woods surrounding this isolated community. After a logging company decimates an area of the forest, a rash of increasingly violent and unexplainable events transpires. Sheriff Paul Shields (Durand) and his deputy (Haas) struggle to confront their own personal demons while facing down a new breed of raw terror that is possibly older than humanity itself, and much hungrier. The BAFTA-winning comedy “Detectorists” debuts on DVD Tuesday. This quirky British comedy won this year’s BAFTAs for Scripted Comedy and Comedy Writer. Mackenzie Crook (“Game of Thrones,” “The Office”), who also wrote and directed the series, and Golden Globe- and Emmy-nominated Toby Jones (“The Hunger Games,” “Wayward Pines”), star as a pair of oddball metal detecting enthusiasts scouring the English countryside for treasures. Andy (Crook) and Lance (Jones) have an unhealthy fixation on uncovering a fabled trove of buried Saxon loot. Unfortunately, the world of high-stakes metal detecting is surprisingly turbulent, as are their personal lives. Andy’s girlfriend, Becky (Rachael Stirling, “The Bletchley Circle”), is none too pleased about the amount of time he sinks into his fruitless hobby, and even less so when a female colleague (Aimee-Ffion Edwards, “Peaky Blinders”) enters the equation. Lance, meanwhile, is still hopelessly in love with his ex-wife—and finds several embarrassing ways to show it. Behind the most excruciating moments lies a winning combination of warmth, eccentricity, and humanity. The DVD includes a 24-minute behind-the-scenes featurette about the series. The six-episode BBC Four series recently made its U.S. premiere on Acorn TV, the premier British and international television-streaming channel in North America, and select public television stations will begin airing the series later this year through APT. A second series is currently in production. 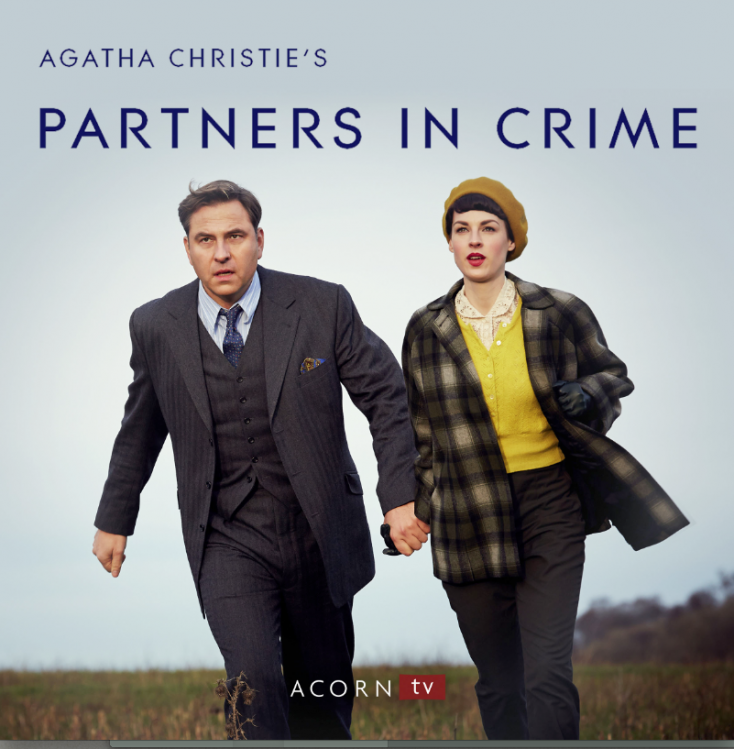 The first two 60-minute episodes of “Agatha Christie’s Partners in Crime,” premiere Thursday, Sept. 3, on Acorn.TV. The series, starring Jessica Raine (“Call the Midwife,” “Wolf Hall”), is based on the books from one of the most revered novelists of all time. The series is a lively adventure that dives into the world of Cold War espionage while keeping humor and hope at its heart. Set in 1950s Britain, wear the nation is rising from the ashes of the Blitz into the grip of a new Soviet threat, the unlikely heroes stumble into a world of murder, undercover agents and Cold War conspiracy. Tuppence (Raine) is a woman who sees adventure around every corner, throwing herself head first into every mystery with passion and zeal, determined to get to the truth no matter what it takes, much to the dismay of her more cautious husband Tommy (David Walliams, “Little Britain”). The duo tackles the cases based on Christie’s “The Secret Adversary” and “N or M” novels in two sumptuous three-part mysteries. The series is directed by Edward Hall (“Downton Abbey”). One of the producers, Mathew Pritchard, is Christie’s grandson. An additional episode will be added every Thursday through Oct. 1 on Acorn.TV (for a total of six).